I met my best friend April 23, 2008. 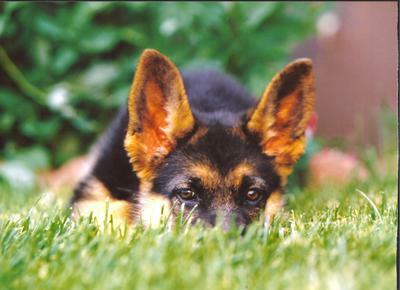 I have had dogs before, Husky and chows, I have always admired GSD's. I started reading about them and come to find out how loyal and hard working they are. 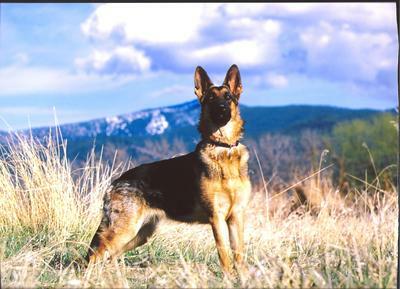 Trying to find a GSD breeder was hard to do in the town I live in, in Montana. I found a breeder and just my luck the breeders puppies were born March of 2008 and I found this out by a professional photographer. I called the breeder up, and we met on Apr 23, 2008. We sat in the back yard and saw these puppies playing jumping and doing what puppies do. 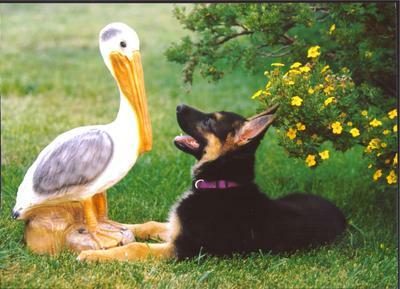 The breeder got frantic for she thought she lost a puppy of whom she called yellow girl. Reason for yellow girl was there was a yellow ribbon arond her neck acting like a collar and to help identify her. All the puppies had a color ribbon to identify them all. Anyways, the breeder got frantic for yellow girl was not playing with the rest of her litter. After looking for yellow girl for about a minute (which also seemed like forever) we found yellow girl. Yellow girl was under my legs fast asleep napping. I am prior military and I am sure some know what the yellow ribbon means. I did not pick yellow girl (Hera).. Yellow girl picked me. After 8 years and 8 months with my best friend of whom I did everything with, I had no choice but to have her put down to pancreatic cancer on Dec 28, 2012. I will miss her deeply. I do find myself calling out to her only to remember that she had passed. First of all let me take a second to tell you how truly sorry I am to hear about the loss of your wonderful Hera. 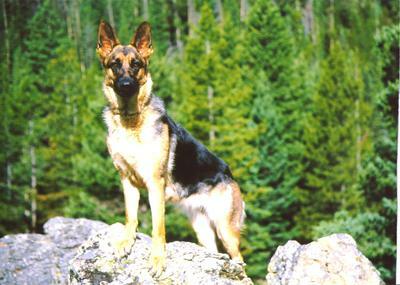 The pictures are lovely and she was definitely a gorgeous specimen of a German Shepherd Dog. The story you shared of how she picked you was so lovely. So she was yours before you even knew she was yours - touching. And that was wonderful to hear how she shared your life for almost 9 years. We all wish you the best in your time of grief. Things will get better but it will take time. Give yourself time to grieve. Thanks so much for sharing your wonderful Hera with us. Your Beautiful girl Hera is resting peacefully with no pain and she is with God and his Angels, which I'm sure she is one - your Angel! She is watching over you and is with you always. Those photos are picture perfect. God Bless Hera!! !